Efforts to preserve this remote corner of Canyon Country in one way or another — along with attendant public debates — stretch back to the 1930s. When it became clear that a dysfunctional Congress would never move on the proposals, the Obama administration included Cedar Mesa, the heart of the Bears Ears monument, on a 2010 list of sites for possible protection under the Antiquities Act. That launched informal and formal discussions on how to preserve the area, and prompted the birth of Utah Diné Bikéyah, a group of local Native Americans interested in preserving the ancestral homeland of numerous tribes. That effort grew into the intertribal coalition that in 2015 formally asked Obama to designate a 1.9 million acre monument. The proposal was debated publicly and openly for months. The administration had numerous exchanges with Utah officials, revealed by documents obtained by the House Oversight Committee at the request of Utah congressmen. Finally, in July 2016, Interior Secretary Sally Jewell and several other top federal land management officials traveled to southeastern Utah, met with local officials and held a public hearing in Bluff, which was attended by approximately 1,000 people. Fact check: This statement has two inaccuracies. First, the supposition that all local residents are opposed to the monument is not true. 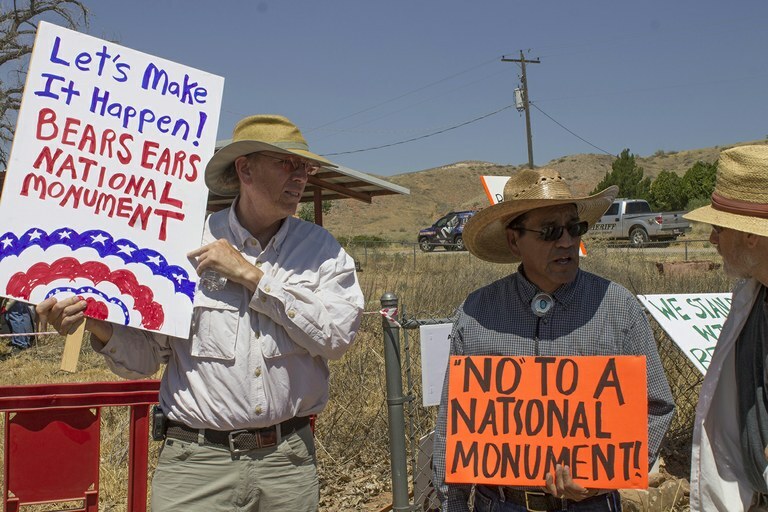 Utah Diné Bikéyah was born locally, with a board made up of local Navajo and Ute Mountain Ute people; six of seven Navajo chapters in San Juan County officially support designation; and many residents spoke in favor of the monument at the Bluff hearing. In designating the monument, Obama was responding to their concerns as well as those of the five sovereign tribes in the coalition. While a majority of the county’s white residents and some Native Americans, particularly Mormons, oppose the monument, it’s clear from the details of the final monument designation that their concerns were heeded as well. Obama left nearly 600,000 acres out of the original proposal, land that holds the potential for motorized recreation, uranium mining, limestone quarrying and other natural resource development. Many local Native Americans were worried about a monument hampering their ability to gather herbs, piñon nuts and firewood; to ease those concerns, the proclamation explicitly preserves such traditional uses. Fact check: This is an outright fabrication, referring to state trust lands that are within the monument boundaries. In Hatch’s alternative universe, those lands were generating oodles of dollars for the local schools until the monument designation cut off the cash flow. That’s not how it works. Proceeds from the lease or sale of state trust lands are distributed to public schools across the state, regardless of which county the state lands are in. Those funds make up a tiny portion of a school district’s overall budget — 1 percent for San Juan County’s school district in 2016 — and they weren’t affected by the monument designation. Nor did the monument designation render those lands “useless.” The state retains control over the parcels. The Obama administration wanted to negotiate a swap for the lands, so that the monument wasn’t checkerboarded with inholdings. The state land board declined. Such an exchange is still possible under the Trump administration; the state schools got $50 million from the feds received as a result of the Grand Staircase-Escalante designation. Ironically, the San Juan School District’s website touts the plethora of public lands and national parks and monuments lying within the county’s borders. Fact check: This is a widely used argument against the monument, that the designation enacts restrictions that will shut down a vibrant extraction economy within its boundaries. A variant of this argument — the monument will hold a bevy of drill rigs at bay — is used to argue in favor of designation. Both claims are dubious. San Juan County does rely on extractive industries. Oil driller Resolute Natural Resources is its No. 1 taxpayer. But that company operates in and around the Aneth Oil Field, well outside the monument’s boundaries. The Daneros uranium mine was within the proposed boundaries, but it and a huge swath of nearby land, rich with paleontological resources, was left out of the final designation, as was most of Lime Ridge and the Raplee Anticline, where oil drilling historically took place. In recent years a couple of exploratory drill rigs have popped up on Cedar Mesa, but they were either on state land, or on already leased federal land, and came up empty. The monument only stops new mineral leases, so these existing drilling rights will not be affected. Advances in drilling technology or extremely high oil prices could someday make drilling, or even tar sands development, feasible within the monument, but there were no pending projects or leases when the monument was designated. Grazing won’t be affected by the monument at all. Not only does the proclamation preserve existing grazing leases, but also allows for new ones. The only extractive industry that might be hampered by the designation is the looting of ancient artifacts — but that is already illegal on federal land. So no jobs will be lost and the economy won’t be harmed by the monument. If anything, the tourist economy will get a boost, as monument status makes an already well-visited area more marketable. Indeed, even as Utah’s politicians try to kill Bears Ears, the state tourism office is actively promoting the new monument. Fact check: Nope. All of the land was already managed by federal land agencies. No private, state or other land was “seized” or “grabbed” in Bears Ears or other monuments. Nor did the locals lose any control over the land in question. In fact, in the case of Bears Ears, local tribes (meaning those with deep ancestral ties to the land in question) gained more control as high-level advisors to the monument manager. While this was a lesser role than the co-management one the tribes hoped for, they do have a louder voice now than they had without a monument. Fact check: False. The monument does cover a huge swath, but it also encompasses a landscape that is home to the physical remnants of over 12,000 years of human occupation — from a Clovis camp, to tens of thousands of Puebloan sites, to the Hole in the Rock Trail — as well as vast paleontological resources. Many of the landforms, including the Bears Ears and Comb Ridge, are spiritually significant to the Navajo, Ute and Pueblo people. This cultural landscape stretches across the new monument and far beyond its borders. 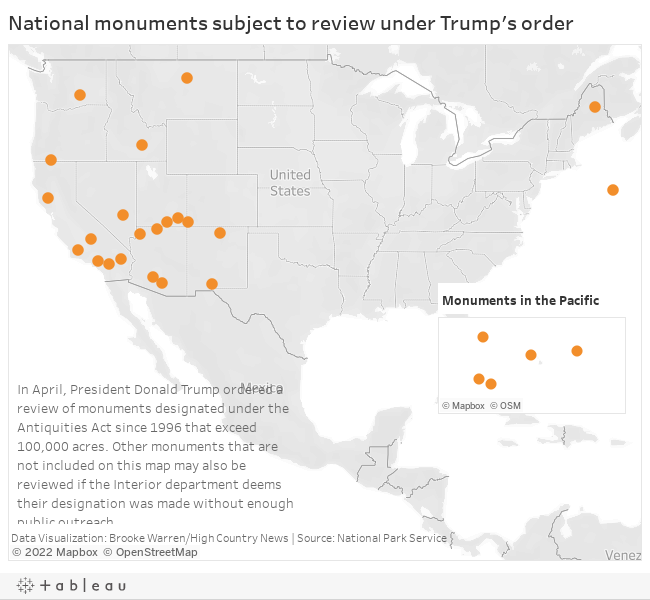 In fact, the smaller monument Obama ultimately proposed already excluded some significant sites. Further diminishment would result in more important antiquities being left out. 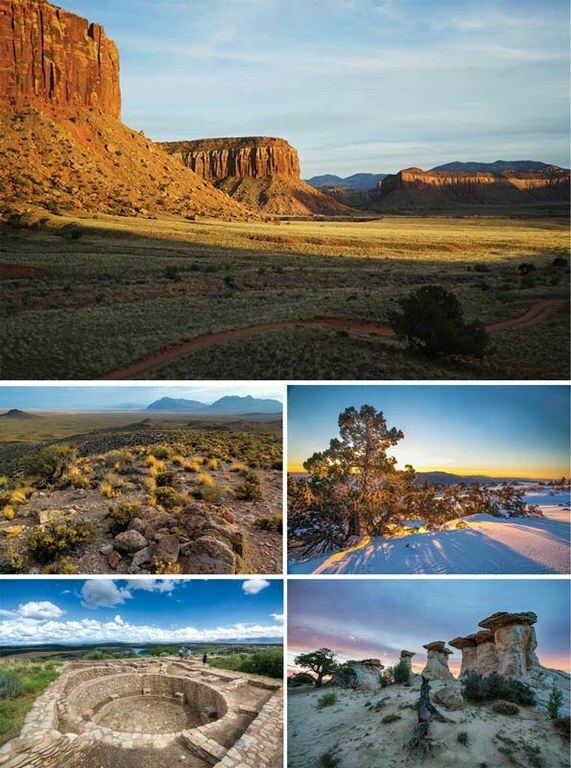 If anything, the new monument is too small to include all of the relevant cultural landscape — it should stretch eastward to connect with Canyons of the Ancients National Monument in southwestern Colorado. Whatever the review, spearheaded by Interior Secretary Ryan Zinke, comes up with, the Antiquities Act gives Trump the power to expand the Bears Ears monument to encompass a greater cultural landscape. It does not, however, give him the power to abolish or significantly diminish the monument. Back in 1938, when President Franklin Roosevelt pondered abolishing the Castle-Pinckney National Monument, created by Calvin Coolidge, his attorney general said it couldn’t be done. “The grant of power to execute a trust,” he wrote, “... by no means implies the further power to undo it when it has been completed.”And in the 1970s, as it put together the Federal Land Policy and Management Act, Congress decreed that the secretary of the Interior can't modify or revoke any withdrawal creating national monuments under the Antiquities Act. Based on the legislative history and a report that accompanied the bill, legal scholars believe that this clause refers to the entire executive branch. If Trump wants to abolish or shrink Bears Ears, he’ll either have to convince Congress to do it, or commit himself to a brutal legal battle against the local tribes that fought so hard to get the monument designated. Was the Bears Ears designation a victory?